There's an article in the on-line version of The Whitstable Times of Whitstable, Kent, England today (February 4, 2010) about one of my favorite academic heralds, entitled Whitstable Pearl: Cecil Humphery-Smith. The article can be found at: http://www.thisiskent.co.uk/whitstable/Whitstable-Pearl-Cecil-Humphery-Smith/article-1806096-detail/article.html It gives just a little bit of background of the man, and then goes into a brief interview of him at his home in Seasalter. 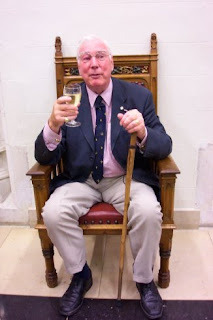 For those of you who don't know Mr. Humphrey-Smith other than as an author of several useful books on heraldry (Anglo-Norman Armory, Anglo-Norman Armory II, Armigerous Ancestors, among others), he is a remarkably knowledgeable man who has, hidden deep within himself, a wicked sense of humor. In addition to owning several of his books (including all of those listed above), I have had the opportunity of meeting him at several of the International Congresses of Genealogical and Heraldic Sciences, most memorably at the ones in Turin, Italy; in Besançon, France; in Bruges, Belgium; and at St. Andrews, Scotland. Anyway, check out the article. It's a pleasant insight into one of the modern titans of heraldry.